Berlusconi was struck in the face with a metal model of Milan's cathedral during a campaign rally. 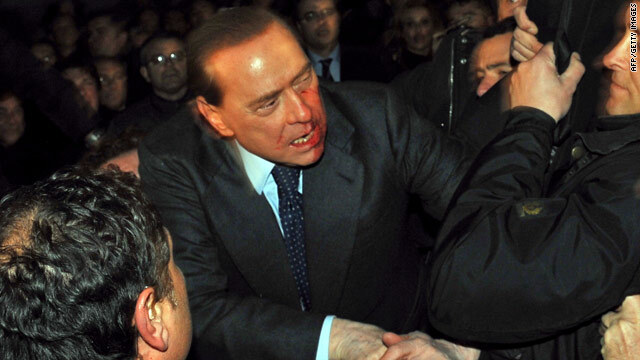 Rome, Italy (CNN) -- A man tried to enter the hospital room of Italian Prime Minister Silvio Berlusconi overnight, as the leader recovered from being hit in the face Sunday. The man was detained. No further details about him were immediately available but Italian media reported that he was carrying a knife. Berlusconi, for his part, will remain in the hospital at least one day longer than expected, his doctor said Wednesday. The PM will be hospitalized at least through Thursday, Alberto Zangrillo announced, citing Berlusconi's difficulty eating and ongoing pain. "Having said this, the clinical conditions of the prime minister are reassuring. We are reassured, not worried. And, I believe I can say that the prime minister will be dismissed tomorrow early afternoon," he said. He also said Berlusconi, 73, would not participate in public events for 10 to 15 days after his release. Berlusconi spent a troubled night with pain in his neck, his spokesman said. His night was "worse than previous ones," spokesman Paolo Bonaiuti said, though he attributed Berlusconi's unease partially to his enforced absence from work. "All his life he has been a very hard-working man. To try to keep him still, to keep him off work, is a titanic task," Bonaiuti said. Berlusconi suffered broken teeth and a fractured nose in the Sunday attack, in which a man threw a souvenir replica of Milan's cathedral at him and hit him in the face. Zangrillo said he does not believe Berlusconi will suffer permanent scars and that his teeth can be reconstructed. Berlusconi's recovery will take another 25 days, Interior Minister Roberto Maroni told Italy's Chamber of Deputies, the lower house of the Parliament. The attacker, Massimo Tartaglia, 42, was arrested shortly after the attack and is now in a Milan prison. Police found Tartaglia was carrying other objects, including pepper spray and a large crucifix in his pockets, which showed the attack was premeditated, Maroni said. Tartaglia had bought the replica of the Duomo di Milano, the city's central cathedral, at a souvenir shop, he said. Tartaglia attacked Berlusconi "because he harbored hatred against the premier," Maroni said. There has been a climate of hatred against Berlusconi in recent months, the interior minister said, with many anti-Berlusconi Web pages. Maroni said he is thinking of introducing regulations to block them. His words echoed those of Senate speaker Renato Schifani, who visited Berlusconi in the hospital Monday and said he was pained by the "hatred" that led to the attack. Berlusconi, a conservative media mogul-turned-politician, has been dogged by allegations of corruption and is the middle of a messy divorce from his second wife. The three-term prime minister faces trial on tax fraud charges after Italy's top court struck down an immunity law that shielded him from prosecution. He denies the charges, calling them politically motivated. His wife of 19 years, Veronica Lario, filed for divorce in May after allegations that an Italian businessman hired escorts for the premier and that Berlusconi had attended the birthday party for an 18-year-old girl, with whom he has denied having an inappropriate relationship. Berlusconi remains popular among the Italian public, however, with his approval ratings holding well over 50 percent. He won a third term in 2008, and his conservative coalition has control of both the Chamber of Deputies and the Senate.